On this dvd Roman gives you new ideas on how to take a logical approach to opening positons that you have not encounter before. Roman will also give you new unplublish lines for White against the Pirc and Center Counter Q-d6 & Qxd5 -Qd8 variations, Roman also covers new lines for Black playing the Scandinavian defense and improve lines in the Accelerated Dragon against the f4 Grand Prix attack and the closed Scilian. These new lines and additions will put the winning edge back in your game. 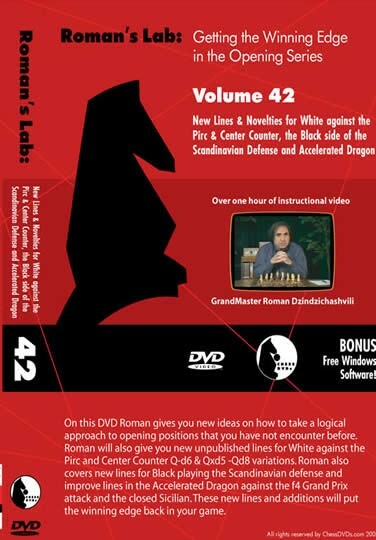 New Lines & Novelties for White against the Pirc & Center Counter, The Black side Of the Scandinavian Defense and Accelerated Dragon Running time 1:18:27 On this dvd Roman gives you new ideas on how to take a logical approach to opening positons that you have not encounter before. Roman will also give you new unplublish lines for White against the Pirc and Center Counter Q-d6 & Qxd5 -Qd8 variations, Roman also covers new lines for Black playing the Scandinavian defense and improve lines in the Accelerated Dragon against the f4 Grand Prix attack and the closed Scilian. These new lines and additions will put the winning edge back in your game.